2nd New Museum Generational Triennial – “The Ungovernables“ – Feb. 15 – April 22, 2012. The 2012 New Museum Triennial is the only recurring exhibition in the United States devoted to presenting young artists from around the globe. This second New Museum Triennial, titled “The Ungovernables,” is curated by Eungie Joo, Keith Haring Director and Curator of Education and Public Programs, with Ryan Inouye, Curatorial Assistant. It will feature thirty-four artists, artist groups, and temporary collectives, born between the mid-1970s and mid-1980s, many of whom have never before exhibited in the US. 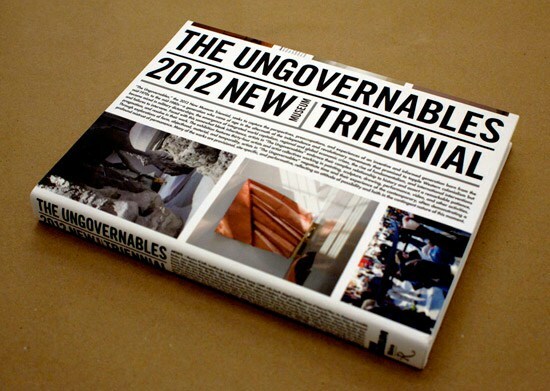 “The Ungovernables” acknowledges the impossibility of fully representing a generation in formation and instead embraces the energy of that generation’s urgencies. These urgencies are formal and philosophical, material and ideological. They stem from the unique experiences of this generation who came of age in the aftermath of the independence and revolutionary movements that promised to topple Western colonialism. However, these revolutions became mired in military dictatorships, the emergence of integrated world capitalism, regional and global economic crises, the rise of fundamentalism, and international interventions as well as failures to intervene. Faced with this somewhat bleak inheritance, artists in “The Ungovernables” embrace their complex relationship to history and assert a remarkable resourcefulness, pragmatism, and hopefulness in their work. Historically used as both a derogative colonial term to justify violent repression of the “natives” (“These people are ungovernable!”) and an affirmative call for civil disobedience (“We will make this country ungovernable!”), ungovernability is a double-edged sword that pursues a radical change in the everyday, but promises an upheaval that is not necessarily controllable. In terms of this exhibition, “The Ungovernables” is meant to suggest both anarchic and organized resistance: protest, chaos, and imagination as a refusal of the extended period of economic, ideological, sectarian, and political conflict that marks the generation’s inheritance. But the title also suggests a dark humor about this inheritance and the nonsentimental, noncynical approaches to history and survival it requires. Rejecting proscribed relationships to history and society, artists in “The Ungovernables” enact the present they desire through their work. The exhibition attempts to provide a platform for these multifaceted presents, with its structure responding to the urgencies of the artists and the form of the works themselves. The exhibition includes artists’ residencies conducted over the past year (including three that extend beyond the opening of this exhibition) and several works, “invisible” in the galleries, that take place before, during, and after the exhibition.